Self-Portrait with Pipe, 2008 #5 is on fire!!! The latest painting in Nelson Diaz’s $1 auction experiment is already up to $285, and there are still 5 1/2 days of bidding left. I have no idea where this is going to wind up, but I have a feeling that this auction might be able to pass the $745 price tag that #1 fetched. I don’t want to discourage anyone from bidding, though. Keep in mind that #2 and #4 went for just over $200, and #3 sold for only slightly more than $100. But, this one could go nuts! Only this morning, the bidding was at a hair over $100. Now, it’s shot through the roof. I have to admit, I am jealous. I do think this is the best of the series so far, and I’m not shocked to see that the bidding has shot up so quickly. I just hope that whoever buys it does so because he loves it. This entry was posted in Articles, New York and tagged Art, art market, Auction, Cigars, eBay, Francis Bacon, Nelson Diaz, Pipe, self-portrait, Smoking on July 8, 2008 by Tom. Auctions for Self-Portrait with Pipe, 2008 #3 and #4 closed late last night, making two eBay users incredibly happy. Each painting normally would fetch several thousand dollars. But, as a result of a Grand Experiment by Nelson Diaz, #4 fetched $112.50 to what appears to be a user in France. #3 sold for slightly more, $203.50. 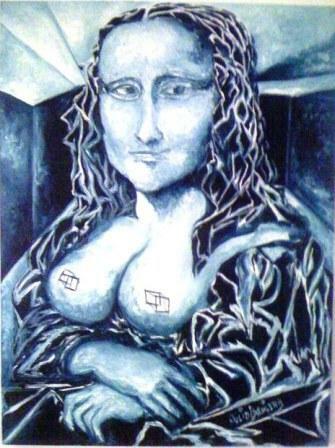 The first painting in this series sold for a substantial $745, but this appears to have been an isolated incident. Two bidders engaged in a last-minute battle to win Self-Portrait with Pipe #1. The second installment in the series, which I own (!!!!!) sold for only $202.50. At this point, the auctions stabilized. The fifth piece is now going under the virtual gavel. The auction began last night, almost as soon as the third and fourth ended. The action is already hot. Though it only became available last night, #5 is already at $102.50, and I’m betting that user’s maximum bid is actually higher (I bid it up to $100, and it turned over to an awkward amount, which means there’s probably more financial muscle behind this bid). 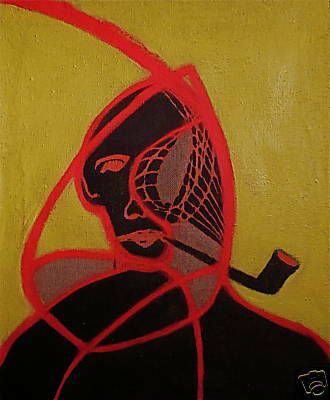 This entry was posted in New York, Uncategorized and tagged Art, art market, Auction, eBay, Francis Bacon, Manhattan, Nelson Diaz, New York, Pipe, Smoking on July 7, 2008 by Tom. SoHo-based artist Nelson Diaz is stepping up the pace. The accomplished artist, whose work is held in the New York Academy of Art and The Eileen Guggenheim Collection, is auctioning two more paintings as a way to protest art market inflation. Using eBay to communicate this unique political message, Diaz has elected to begin the bidding at $1 and has set a price objective of $300 per painting … at most. Diaz embarked on this project following the May 2008 Christie’s Contemporary Art Auction, at which a triptych by British master Francis Bacon fetched a princely sum of $86 million. Based on conversations he had had with Bacon during a weekend in 1985, Diaz is convinced that the eccentric and reclusive genius would not have been happy with the prices collectors are willing to pay for his work. Thus, the “Grand eBay Experiment,” as Diaz calls it, is a show of respect for and solidarity with Bacon. Currently, the bids for both auctions are still at $1, but much could change in the next 6+ days. Keep an eye on these auctions, and don’t be afraid to participate! This entry was posted in Articles, New York, Uncategorized and tagged Art, art market, Auction, eBay, Francis Bacon, Nelson Diaz, political statement on June 30, 2008 by Tom. As followers of this blog know, I’ve been watching Nelson Diaz’s eBay experiment closely. So far, the price is up to $56. Well, he has put together a video explaining his thinking. Check it out. 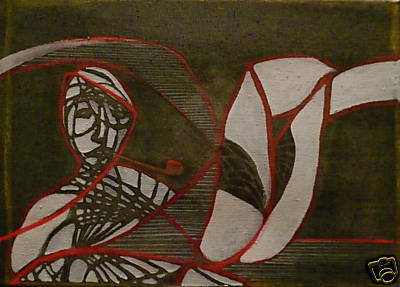 This entry was posted in New York and tagged Art, Auction, eBay, Francis Bacon, Nelson Diaz on June 21, 2008 by Tom.